Leon Camier ended up 11th inWorldSBK Race 1 and – with the 5 points obtained – the Brit remains 9th in overall standing. In WorldSSP PJ Jacobsen got the second seasonal pole position in three rounds, after setting the best lap time in Tissot-Superpole2. 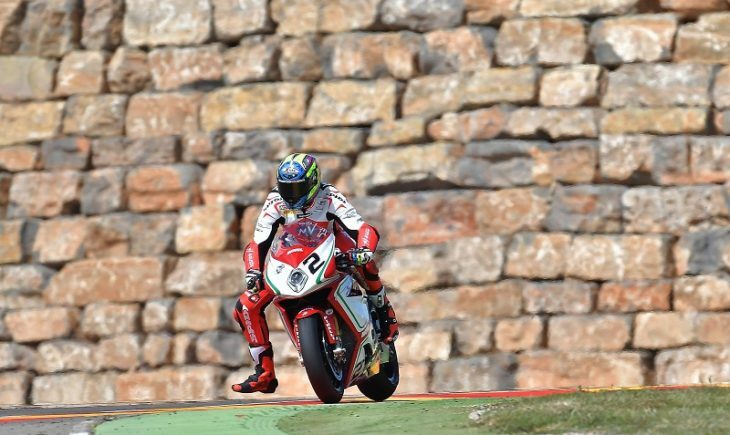 The first race of this MOTUL FIM Superbike World Championship – round 3 was staged this morning, Saturday, April 1, on the Motorland Aragon circuit in Spain. Leon Camier kicked off Race 1 from the 15th position on grid, due to some technical problems that slowed him down in the early stages of the weekend. When the lights went out on the straight, Camier passed several riders in the first corner fighting in 14th position. Thanks to his constant race pace the Brit rider ended up 11th, gaining 5 points on the overall standing. After setting the fastest time in Friday’s combined timesheet, today PJ Jacobsen was back on track at the Motorland Aragon race track. Thanks to this results the 23-years old American rider was able to enter the Tissot-Superpole2 this afternoon, where he set the fastest time (1’54.948), getting his 2nd pole position after only 3 races. PJ’s teammate Alessandro Zaccone set the 11th time (1st in ESS) after his first Tissot-Superpole with Team MV Agusta Reparto Corse. Leon Camier #2 WorldSBK –Today we struggled a little bit more than usual and honestly I don’t know what was wrong with the bike, I think it was an electronic problem, maybe a broken sensor, but my team is working hard on my bike in order to fix it as soon as they can. Despite this, considering I wasn’t able to fight for the top positions in Race1 I just tried to push as hard as I could and get some points for the championship. Patrick PJ Jacobsen #99 WorldSSP – I am absolutely happy with this second pole position. All the MV Agusta team did a very good job today and I can’t thank them enough. The only little problems today were the wind, too strong, and the tyres, but in the end I had a very positive feeling on by bike and I was able to close in pole position. The main target for tomorrow is win the race or at least get the podium, so I can bridge the gap with the top riders and get back in the fight for the championship. Alessandro Zaccone #61 ESS – All in all I am happy with this result. Yesterday we did a good job and I managed to get into the Tissot-Superpole2 at my first race weekend with Team MV Agusta Reparto Corse. Surely, I still have too few km with this bike and we will have to work hard to make the most of each session on track. Tomorrow I hope we can make another step forward ahead of the race. Yamaha XSR900 Abarth Arriving in Europe … Not the U.S.